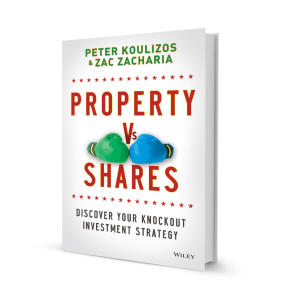 This is the official website of the popular investment book, Property vs Shares – Discover your Knockout Investment Strategy! Written by Peter Koulizos and Zac Zacharia, and now in its second reprint, this book is regarded as a definitive reference guide that dispells the myths and presents the facts in a clear and easy-to-understand way so that you can make an informed decision. The book is available in softcover and digital format. We wrote this book to present investors with the unbiased truth about investing in Property and Shares. No other book compares these 2 asset classes side-by-side like this. Our goal was to help you understand and develop your own investment strategy by being presented with the facts. We will be updating this site regularly with our insights and opinions and also provide you with new and relevant content to expand your learning beyond the learnings from the book. Through our website, you will also be able to contact and interact with us. We do hope you enjoy our book, and we trust that it will help get you on the path to financial freedom. Peter Koulizos & Zac Zacharia, Adelaide, August 2013.